American Patriot is aiming for 15 wells to be restarted by 30 September, targeting 50bopd and US$60k revenue per month. 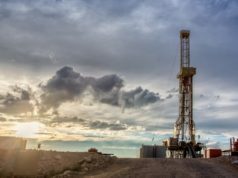 American Patriot Oil & Gas (ASX: AOW) has restarted production at its onshore Goose Creek and CWS Aceite assets in Texas, generating 22 barrels of oil per day from seven wells. The company has so far generated revenue of US$32,592 from production sold, and expects to generate at least a further US$40,000 by month end with a daily average of up to 40bopd. A further 15 wells will be restarted by end September, targeting 50bopd and US$60,000 in revenue per month. Goose Creek and CWS Aceite were part of a series of shut-in assets acquired by American Patriot in 2017 with a view to re-working and re-starting production. Goose Creek is a mature legacy field with significant proven behind pipe pay which has not yet been exploited, and the ability to grow production for minimal capital expenditure. Acquired for US$430,000, American Patriot said the asset contains 300,000 barrels equivalent proven oil and gas 1P reserves and has the potential to generate US$11m revenue with a PV10 value of $US3m. The CWS Aceite wells in south-west Texas produce from various formations and have potential for up to 50 barrels of oil equivalent per day, post restart shut-in production, re-works and new drills. American Patriot chief executive officer Alexis Clark said the restart is an important milestone as the company prepares to commence sustained production. “In the near future, we expect to significantly grow production and net cash flows just from these assets, excluding the potential uplift from other acquisitions,” he said. American Patriot continues to progress its strategy of acquiring conventional producing properties with low operating costs onshore USA, with reserve reports and significant production upside via shut-in wells, workover potential, behind pipe potential and infill drilling upside. This week, the company reported the completion of a site visit with lender White Oak Global Advisers to conventional oil and gas assets in the gulf coast of Texas, which it is in the process of acquiring from Texas-based Foothills Resources for US$15m. Comprising 62 wells over 17.7 square kilometres, the Foothills assets currently produce a net 300bopd, which American Patriot believes could grow by over 200bopd via a low-cost capex program including workovers and recompletions. The operated assets are believed to contain 2,848,000boe proven oil and gas 1P reserves, with an additional 1.8 million barrels of oil equivalent additional probable reserves resulting in 4.6mmboe of total 2P reserves. American Patriot has also signed a purchase and sale agreement with Magnolia Petroleum Company and Burnett Petroleum Company for the acquisition of the Magnolia and Burnett mature legacy assets in Texas. The Magnolia assets currently produce 62bopd and 535 thousand cubic feet per day of gas (mcfd), or 151boepd, and have workover and upside drilling potential. The Burnett package is spread across two properties defined as the Rose joint venture and Lucky Leon field, with a current production rate of 46bopd oil and 22mcfd gas production from the Yegua and Wilcox formations. At the closure of these deals and following the completion of a capex program based on an oil price of US$65 per barrel, American Patriot’s estimated earnings before interest tax depreciation and amortisation (EBITDA) for all assets in calendar year 2019 will increase to approximately US$11.5m per annum. And the company is not about to slow down on its buying spree any time soon. “We have already commenced the early stage process of identifying the next asset acquisition, which will be more than double the current deal size,” Mr Clark said. At midday, American Patriot’s share price was steady at $0.022.